Our Sathya bracelet boasts a gorgeous combination of marfil and carbonado marble. This is the perfect blend of stones to aid in enhancing ones mind activity and can help us master our thoughts. 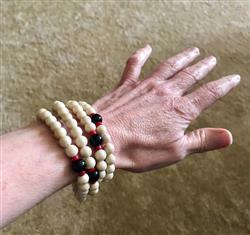 I purchased the bracelets for my team of yoga and pilates instructors. Not only did they love them, but the fact that they all had the same one, increased their connectedness for our clients. Thank you Mala Prayer! I love my Sathya 108 bead bracelet! I love the way the accent beads align! That was a sweet surprise when I put it on. Thanks lovely - have a beautiful day! These prayer beads are lovely, a great weight, and wear well on my wrist for convenience. They also came with a perfect little bag for safe keeping. I am very happy with these beads!